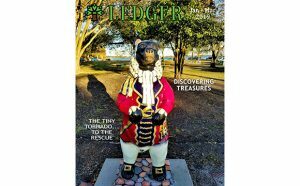 The Ledger is a mini version of New Bern Now.com, as our website is our “Home Base” and is updated daily. The Ledger was created as a handy reference to inform residents of what’s happening in the Greater New Bern area. It was also created to help visitors learn more about our great town as an area guide to learn about the latest happenings and information in the Greater New Bern area! We are “ordinary” folks who enjoy learning about our community – from River Bend, Fairfield Harbour, Carolina Pines, Trent Woods, Spring Garden, Olde Town, Downtown, Uptown, and everything in between! We are happy to receive information from readers who want to spread the word about events and interesting happenings. We also enjoy sharing our experiences with you. We are “local citizens”, making us a “citizen media company”. Our GOAL is to Promote all the great things New Bern and the surrounding towns have to offer! With over 4,000 pages, it’s a “community diary” about New Bern, North Carolina. Advertisements cover the cost of printing the hardcopies. Special thanks to our advertisers and sponsors! You can pick up the latest edition at the New Bern’s Airport along with over 100 businesses and nonprofits around town. We really appreciate everyone’s support in sending us the latest happenings in your community and we look forward to hearing from you! Send us your free non-profit announcement and business listings via email at email or call 252-638-6858.